See this picture? It’s a picture showing me having a serious discussion with some of my friends. Well, more like experienced seniors. It was taken this evening, during our ‘How To Conduct Take Charge Program’ in Bangi. It was during our lunch break, when we talked about early childhood. Look at the photos, and trust me, all of them are great in their field. They opened a taska, or kindergarten for kids before primary school. 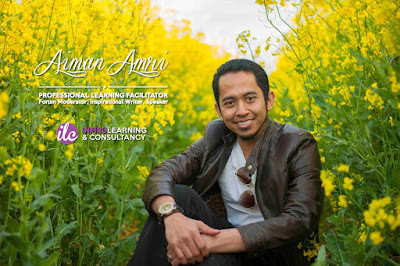 They have their own way of educating the early youths, and interestingly, some of them have Master in Early Childhood from UniTAR. Yes. Some of them into that. What's wrong with that? Did he forgot where did he learnt about ABC? If it is not from his kindergarten teacher, he would not even able to type his tweet. Please. Don't look down on them. And when I show you this photo, trust me. They are really in serious passion about kids' development, using various concept to enhance the learning and encourage the development of the kids. Guess what? Their response was none of these below. "Ohhhh.. You can read people's mind?" "Oh no! Don't psycho me!" "Will you be working with crazy people?" Yeah. None of those. You feel what I mean? 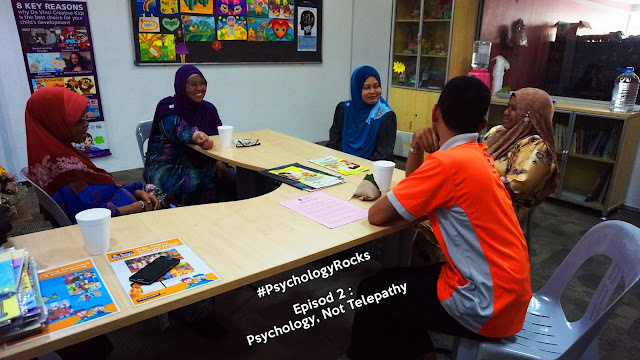 Studying psychology is not studying telepathy. It is really great and comfortable to be with people who really understand about my "language". They do not have the typical misconception about PSYCHOLOGY, and most importantly, we are able to discuss in the "same language." It's sadden me to see how people have the rude pre-judgement about Psychology course. It's saddening. Really. I understand that some of you just want to make a joke to break the ice by saying that stupid stuff. Well guess what? It will only break my rapport with you when you said that. "Psychology ini belajar apa ye?" "What's Psychology is all about?" Yes. Just ask. I won't eat you. In fact, I'll be more than happy to answer your question. Well, that is, if you really wanna learn.